There are many courses in currency trading and we offer one on this site but what makes a good currency trading course? Let's have a look at some key elements that a course should contain, to help you get the right FOREX education and training to achieve currency trading success. There are a huge amount of courses online but how do you know which is the best? Below we have outlined a simple check list which is for beginners, so you can follow it and find the best FX education which can help you, become a profitable FOREX trader. We have a professional FOREX trading course on this site and we are experienced currency traders - but when you look at most courses online, they don't come from traders at all, just marketing companies, selling the message of making money with no effort so firstly look for realism in the promotional material. Don't be deceived by people, telling you that you can make a fortune with no effort – you can't. If you want to get a course in currency trading then it is up to you to learn the logic, understand it, have confidence in it and apply it with discipline, to lead you to long term success. Here are some points to be aware of when buying a currency trading course. There are many courses that will tell you they can trade with scientific accuracy or have some secret which they have discovered which can give you guaranteed profits. You should however keep in mind, if there was such an easy way of predicting currency prices, there would actually be no market at all, as we would all know the price in beforehand and prices of currency pairs would no longer move. Your horoscope predicts the future and so do some gurus and trading mentors but your horoscope, will probably be right more often than the FOREX guru, who can see the future! The king of the courses which preach the “ we can see what will happen tomorrow” theories, are ones based on Fibonacci number sequence. The Fibonacci number sequence has nothing to do with trading and was simply designed to solve a problem connnected with exponential growth. Many FOREX coaches and trainers present it, as a scientific theory for trading or based on universal law but it is anything but – if it were scientific the retracements would work every single time but they don't. They ONLY work some of the time and that's not a universal law or science. You can pick any retracement percentage you like and it will work some the time so avoid this strategy. You also need to avoid two other trading methods which use the number sequence and also claim, markets move to some higher order which are Elliot Wave theory and strategies based on Gann theory. FOREX trainers, love taking these methods and sell them at high prices, to naïve traders who think they are going to learn the currency trading secret which will make them rich but they soon lose their money. Anyone can make up any track record and most vendors of training material online do this. All they do is do trades on paper going backwards and pretend they bought or sold at certain levels in hindsight but a simulated track record means nothing in terms of future profit potential. Of course trading on a chart going backwards is a lot easier than trading for real going forwards. You also get what are supposed to be, real trading statements of profits but there normally demo anything but real. You sometimes see the vendors bank account which has been doctored, to show millions in profits. Last but not least you get the laughable video testimonials which most vendors buy from places like fiverr.com. You can get one for just $5.00 but these people who do the testimonials, will endorse anything for just five bucks. If it looks to good to be true, the track record is to good to be true so use common sense and click away from any course which promotes this message. How on earth can you promise a regular income from a market which is driven by humans so by its very nature is un-predictable? No trader makes a regular monthly income from FOREX trading, all will have periods of drawdown and losses furthermore, you can never anticipate how long they will last. Over the longer term though, a soundly based FOREX trading strategy will make money - but in shorter time frames anything can happen. FOREX day trading and scalping strategies are simply the best ways to wipe-out your account equity. Volatility in short term time frames is very random, support and resistance levels are meaningless so you can't trade them. The result is in day trading - you can't get the odds in your favour as the time frame is to short and this means, you will lose all your money. Avoid day trading systems and trade longer term time frames. Any FOREX trading course will make claims and give you the benefits it thinks it will give you and that's fair enough – but the vendor is asking you to believe these claims and you therefore should have a right to have your money back, if the course does not deliver what you expect. You should look for a guarantee that offers to rebate your money in FULL with no penalties after a trial period should you not be satisfied. What you are looking for is a training course that suits your personality. So you can have one that is simply rules that you have to execute which give you automatic trade entry and exit signals or you can choose one that gives you a set of manual guidelines which are flexible but allows you to pull the trigger only on the trades you think are best. Execution Only or Manual Override? As a general rule it takes tremendous confidence and discipline to execute mechanical trading signals, so if you opt for this method, make sure that you are have the rules revealed to you so you understand them and you have rock solid confidence in the logic so you follow them with discipline. Other currency trading courses will give you a manual override i.e. a broad set of rules for you to apply on the trade set ups you think are best. There are still rules to follow, but you don't have to execute every trade. These courses will also give you options on stops, money management and targets. These can be easier for traders to follow, as the trader has control over the set ups they take. The method you choose will be down to your own personality and is very much a personal choice. Trend following or Swing Trading? There are two methods to choose from, you can either swing trade or follow long term trends. Again, the method you choose will be down to your personality. Following a long term FOREX trend following system takes a lot more discipline than following swing trading system. Why? Because with long term FOREX trend following, you have to hold on to the trade when open equity dips. These dips in open equity can sometimes be very steep and last for many weeks on end and it's hard to hold onto your open trade through them. Sure, long term currency trend following is rewarding but it requires a lot of discipline, as well as the patience to wait for the big trends to emerge and also to have the courage and discipline to hold them through sharp, short term drawdowns. Swing trading needs less discipline and this is because, you don't hold trades for very long and profits and losses are taken quickly. Some currency trading courses can be adapted to trade both methods and ours is one of them. Before you start to trade, decide which method is best for you, or mix them together. 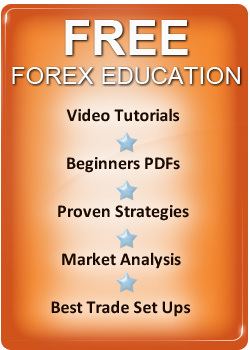 The FOREX course you choose, should give you definable trading edge. A trading edge is the part of the course which gives you a method of trading which gives the ability to enter the small minority, of just 5% who are winning traders. The trading edge the training material gives you should be clearly defined. You need to understand the edge and be able to apply it with confidence to enjoy currency trading success. You will have losing periods so you need to be confident in your edge to win long term, to stick with your trading strategy. Most courses simply tell you currency trading basics such as – how to draw trend lines or how a variety of FOREX indicators work but this is not an edge! You can get all this information for free online. Another point to keep in mind is - to avoid advanced trading and training courses. The word advanced is simply used, to charge more money for the material! It's a well known fact, that simple currency trading strategies are more effective at making money so leave the complicated and advanced education but there not – Simple trading strategies are best. You should be entitled to full support so make sure you can ask questions as and when you wish. You should also look for a FOREX course which also offers trade set ups in real time, using the trading method that is taught by the trainer or coach so you can see, how the vendor applies the tools and techniques taught and how profitable the trading is in real time. If you find a good currency course, you need to learn the logic of why it works, to have confidence in it and then, you be able to apply the methodology yourself with discipline. Trading currencies is a personal experience and you will only follow, your trading plan with discipline if you generate the trading signals yourself and know why the logic works which will give you the confidence to trade it through periods of losses to long term success. You need to find a course that not only you have confidence in but also one that suits your trading personality. To find the best currency trading courses you must do your research, as most which are sold online do not come from traders, just marketers trying to make money selling a message of greed and easy money. Do your homework, follow the check list in this article and you will find a trading course which can fast track you, to becoming a profitable FOREX trader from home. If you would like to read more about the Best trading strategies and systems, you can view them on our blog and keep up to date, with all the latest FX products, research and news.